Remember moving into your first home or apartment? Remember the freedom you felt? The excitement of independence? You felt powerful because the decisions were yours alone. You decided where your furniture went, how late you stayed up, how late you stayed out, what you ate, who visited you, and what you watched on T.V. Cleanliness was now in your hands at last, and you could live in filth if you wanted. 1. Peel the cucumber and spoon out the seeds. 2. Grate the cucumber and add to a medium sized bowl. 3. Lightly drain the extra juice from grated cucumber. 4. Add the vinegar, salt, dill, and garlic to the bowl, and stir. 5. Let sit for one hour. 6. Stir in the yogurt. Let sit for 24 hours. 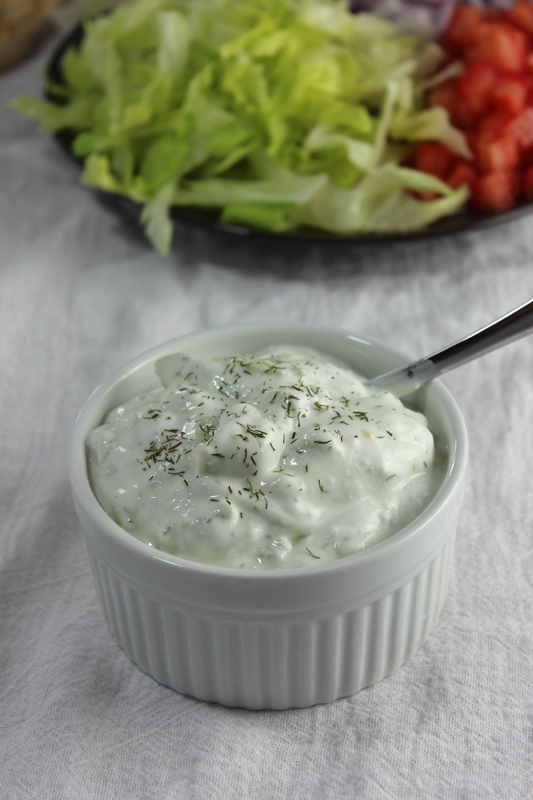 What’s your favorite food to have with Tzatziki sauce? Let us know in the comments! I love having this at Greek restaurants! I want to try making it 🙂 It looks great. I love cucumbers so I might give this a try. I never heard of Tzatziki sauce. Thanks for the info. The dill and vinegar give the sauce a bit of a kick. This sounds scrumptious! Thanks for sharing! Thanks for the recipe! I love this sauce! Now all we need is homemade Pita! Yum! Love Tzatziki sauce! I just made it last week in fact! Yours looks delicious and your photos are beautiful! I am always looking for new things to create in the kitchen. I will have to give this a try.